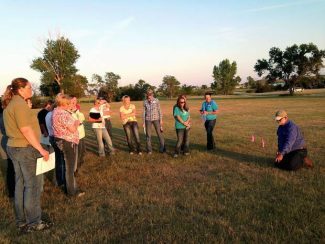 If you're a woman involved in the agriculture industry, then Annie's Project may be the program for you. Have you ever asked a farm/ranch management question and not understood the answer Have you ever signed papers at the bank or FSA and not really understood what they were for? Have you been thinking about if you have enough insurance or an estate plan? Have you wished you knew more about marketing your cattle or crops? If you answered "yes" to any one of these questions then you are a perfect candidate for Annie's Project. Annie's Project was designed to empower women by providing detailed farm/ranch management information and build networks between women. Over a six-week period, women will learn how to develop financial records, learn key communication skills, ask questions about retirement and estate planning, expand marketing knowledge – all while having fun in a supportive learning environment. Classes meet once a week beginning May 7, 2015 in St.Onge at the Community Hall. 234 1st street. The classes continue May 7, 14, 21, 28 and June 4 and 11. Each session will run from 6 to 9 p.m. The cost is $150 per person and meals will be served at each session. Registration cost will be reduced based on the amount of local sponsorship received. Pre-registration is due by April 24. For more information contact Shannon Sand, SDSU Extension Livestock Business Management Field Specialist at the SDSU Extension Regional Center in Rapid City at 605-394-1722 or shannon.sand@sdstate.edu. Class space is limited.